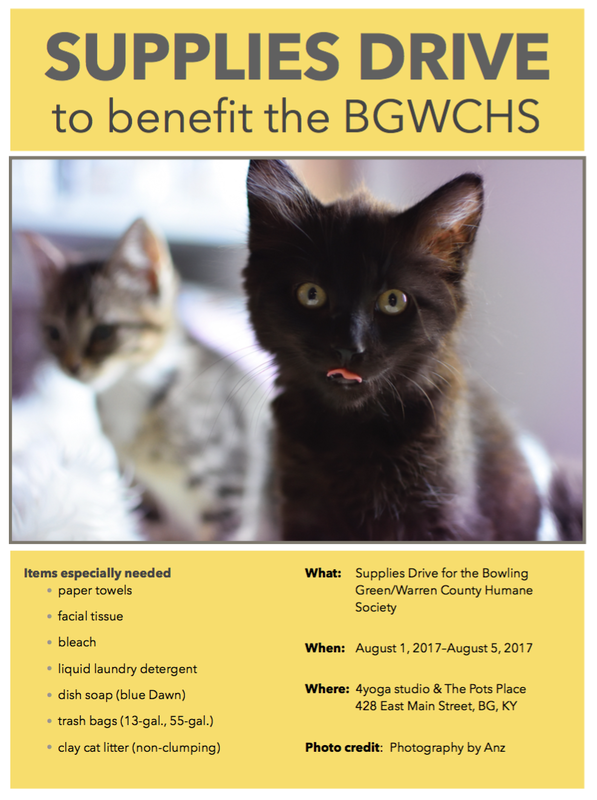 Many of you have asked how you can demonstrate your support for the Bowling Green-Warren County Humane Society even if you are unable to participate in the upcoming Kitten Yoga benefit classes. We are partnering with The Pots Place to host a supplies drive for the shelter! The flyer below lists the supplies that the shelter needs most, but the folks there will be grateful for anything you provide (see the wish list section of the shelter’s website for a comprehensive list). To donate bring your item(s) to The Pots Place anytime between August 1 and August 5 at 1 p.m. We will place collection bins both downstairs and upstairs and will deliver the items to the shelter when we return the kittens and donate the class fees after the second yoga class! This entry was posted in community, schedule and tagged August, Bowling Green Warren County Humane Society, Cassandra Cantrell. Bookmark the permalink.